China is the homeland of tea, which is the most popular beverage in the country. 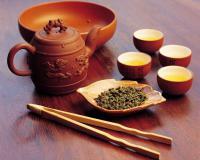 It is believed that Chinese people have enjoyed tea for more than 4,000 years. Tea is the dried and processed leaves of the tea bush, plants called camellia sinensis. There are several varieties of this shrub, thus producing many types of teas. The growth of tea requires proper climatic conditions, soil, rainfall, altitude and other natural elements. Tea bushes grow well in areas where it is warm and humid. The soil should be acidic, meaning the soil's PH value ranges between 4.5 and 6. The land where tea is grown must have a rainfall exceeding 1,000 mm a year, and has to be well-drained. Tea is known to contain rich and various vitamins, especially Vitamin C. Therefore it is important to remember that while steeping tea, the temperature of water should be below 80℃, otherwise the vitamins in the tealeaves are likely to be destroyed. Chinese tea may be classified into the following categories based on the different methods by which it is processed. 1) Green tea: Green tea is the variety that keeps the original color of the tealeaves. It's unfermented. Leaves are picked, dried and briefly heated to destroy the grassy smell. Green Tea has the most medical value and the least caffeine content of all Chinese tea classes. About 50% of China's teas are Green tea. 2) Black tea: Black tea, known as "red tea" in China, is fermented before baking. Black tea undergoes withering (drying), left to ferment for a long while, and then roasted. Black tea has a robust taste and is full-bodied enough to stand up to milk and sugar. It is the only kind of Chinese teas that can be drunk with milk or sugar. 3) White tea: China is famous for its beautifully subtle and young white teas. It is unfermented, undergoing minimal processing, simply air-dried and made from unopened silver buds and outer leaf tips. It is the rarest of teas having a very brief picking season when the climatic conditions are perfect. 4) Oolong tea: A cross between black tea's strength and green tea’s freshness, Oolong is medium-bodied, smoky, and a bit fruity. Oolong Tea leaves are withered and spread before a brief fermentation process. Then it is fried, rolled and roasted. Oolong Tea is the serious Chinese tea drinker's tea. Beginners in Oolong Tea should be careful as even though flavor is only mild to medium, the tea could be very strong. 6) Scented Tea: This kind of tea is made by mixing a base tea, such as black, green, or oolong, and adding flower petals or blossoms, herbs, or even sliced fruit or fruit peel. It imparts a delicate and interesting taste, and of course a wonderful aroma. The different kinds of Scented Tea are named after the flower, with which the tea is scented, such as jasmine tea, chrysanthemum tea, litchi tea, etc. Firstly, tea leaves contain some aromatic substances and little calories that can dilute fat, which may help one lose weight. Second, Scientific studies in recent years have found that tealeaves, especially green tea, contain polyphenols which can function as antioxidant. Antioxidants may help absorb radioactive strontium, and provide radiation protection. Thirdly, Tea can also be used as a natural antiseptic. In the past, Chinese people in remote areas used tea to wash wounds for sterilization and healing. It contains fluoride which helps prevent tooth decay. There are still many other benefits of drinking tea. However, there are always two sides to everything. Overdrinking of tea may result in stomach disorder or insomnia. Therefore those who are not used to tea are not suggested to have tea before bed, otherwise one may find it hard to fall asleep. China is a country with time-honored civilization, ceremony and decorum. When guests are visiting, it is polite and necessary to serve tea. You may ask the guest which kind of tea they prefer, and serve in the most appropriate cups. During the course of tea-serving, the host should pay attention to the tea remaining in the cup and the kettle. In case half of the cup or kettle has been consumed, boiling water should be added to fill the cups and kettles, so that tea retains the same bouquet and warmth through the entire course. To complement the fragrance of tea, some snacks, sweets or other dishes may be served.